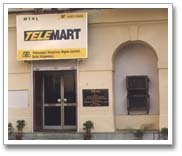 Heartly welcome to MTNL's newly opened Teleshop named as 'SANCHAR HAAT' . The 'SANCHAR HAAT' has been opened on the concept to provide a total telecom solution and an instant connectivity to basic telephone services,value added and new services, turning all this into a shopping experience. One of the unique features of 'SANCHAR HAAT' is to provide liberty to the customers to select a telephone instrument and a telephone number of their choice. The Phone Book'99 is also provided in advance. MTNL will try to provide the telephone connection within a week's time. In case of any delay in the provisioning of the telephone connection please contact the 'SANCHAR HAAT' free-phone telephone numbers only. Registration of other services can also be made in the 'SANCHAR HAAT'. NOTE :- Facility of ISDN PCO, Internet PCO and Telecardiology is also available. For details please feel free to contact 'SANCHAR HAAT' on toll free numbers. Customer has liberty to select the telephone number & instrument of their choice at the time of booking.